I’m already getting the feeling that the four elements of Photography Program are separate products packaged as a single subscription. There is a loose inter-working between Photoshop, Lightroom, Behance and Prosite but Creative Cloud doesn’t add much to the package, at least at the moment. Behance (http://www.behance.net/) is a Cloud repository for photography projects where you can make sets of images available publicly for other to see and comment. It is intended for work in progress, and is a bit like a blog really, or perhaps a more up-market Flickr. The images feed ProSite, which packages & publishes them in a polished, customisable form. If it’s as good as the marketing blurb would have us believe, it should replace my stand-alone Web site. Well, we’ll see! In December 2012 Behance and ProSite became subsidiary operations of Adobe Systems Inc., So I guess we can look forward to better integration in the future, but at the moment your Adobe ID isn’t linked to Behance or ProSite; a separate account is needed. I’ve covered the account creation process in a previous post; here we’ll see how Lightroom, Photoshop and Behance work together. I have several projects that I’d like to get feedback on so I’ll use one of these as a test. Eventually I will publish these images on ProSite, and a quick read through the Beginners Guide shows that the maximum image size it can display is 1920px wide so that’s what I’ll set in the Image Size section of the dialogue. Despite this, when I upload images to Behance they all come out as 710px wide, so that’s the first bug. Worse is to come. Conclusion: at the moment (i.e. 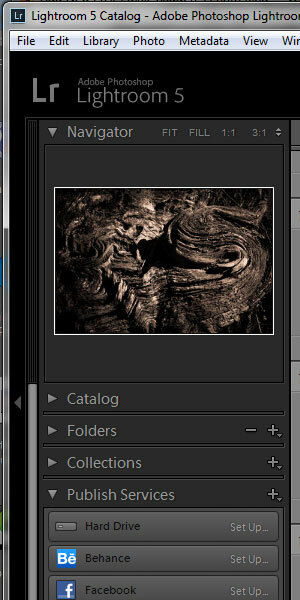 Lightroom 5.2) the Behance publishing plugin is too limiting to be worth using in my own workflow. Photoshop CC sports a new menu option to Share on Behance, so let’s see if that fares any better than Lightroom. Photoshop CC’s Share on Behance option only exports the currently visible image to Behance. The image can be titled and tagged, and a multi-layered PSD will be exported automatically as a flat JPEG, but the width is again limited to 710px. And the image can only be uploaded as WIP, not added to a project. So, unless you have a loyal following on Behance who are willing to comment on your images, perhaps as part of a distributed team working collaboratively, this feature seems of limited value. Conclusion: the Share on Behance feature in PsCC is too limited to be of real value outside of a niche set of users. It is unlikely I’ll use it. The limited interface between Ps, Lr and Behance may be of some use to Adobe’s core creatives if they need tools for rapid iterations of work in progress, but Photography Program is aimed at professional and amateur photographers whose workflow and requirements are different. In particular, Adobe hasn’t catered for those who see Behance mainly as a staging post to making a full Web site available via Projects and ProSite. 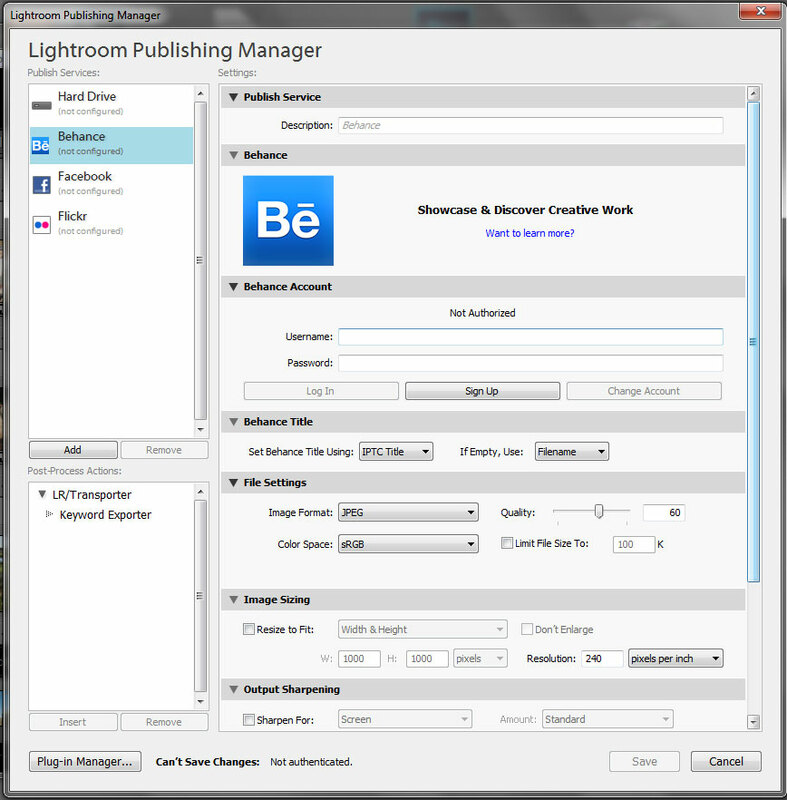 Adobe urgently needs to improve the functionality of the Lightroom Behance publishing plugin if it wants to claim any sort of integration between the elements of its Photography Program. And Behance should add the ability to migrate images from WIP to projects rather than having to re-upload them (what a waste of time and bandwidth it is at the moment) as well as improving bulk operations on files (every file has to be uploaded and deleted individually). Until the plugin improves, my workflow will be to export images from Lightroom to my hard drive then upload them as projects via the Behance Web interface. I’ve had Photoshop Photography Program installed for only a few days and I’ve already been prompted to update Photoshop CS6 (i.e. version 13), Photoshop CC (i.e. version 14) and CameraRAW. I clicked to Update All but after a few minutes it told me there was an error, please try again. Clicking again simply gave me another error message about a corrupt download. Unfortunately CC would not re-download the files so I tried another approach. I opened Photoshop CC and clicked Help | Updates. Interestingly, this opened Adobe Application Manager, which proceeded to download and update the applications successfully. The Creative Cloud application has been available for a little while but is clearly still not as robust as the older Application Manager. 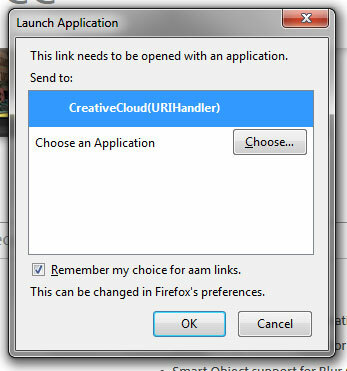 Let’s hope the Creative Cloud application can update itself more successfully than it does the other applications! Adobe’s Photography Program is now live at https://creative.adobe.com/plans/offer/photoshop+lightroom?sdid=KIHZP. Interestingly, it is now being touted as the Photoshop Photography Program. Anyone who owns a copy of Photoshop CS3 or later can purchase a licence for £8.78 /month including VAT for the next year. As I explained in a previous post, this represents a potentially good deal. However it is a special price that will only last a year, after which we can only assume that the price will be close to the Photoshop CC licence of £17.58 inc. VAT. Initially I don’t expect to see a huge advantage from the software point of view: I might get updates more quickly, but it’s only after 12-18 months that I’m likely to see significant advantage as Adobe moves more functionality and support to their Creative Cloud offerings. The immediate benefit to me will be the Cloud storage and web site creation. So normally I wouldn’t rush to adopt this new service but I am intensely curious about Adobe’s move – for those who use Adobe’s software professionally the cost may well be justified but what about us amateurs? Will it be worth it not just now but into the future? Just for once, I’m going to be an early adopter of this service and document my experiences here. If you don’t have one already, it’s an easy matter to create one. But if you don’t have one you might get problems since I’m not sure how else Adobe will have your ownership of Photoshop recorded in their system. Yes that’s right, Adobe checks its records (step 2) to make sure you are entitled to the special offer. The T&Cs are straight forward and if you are happy, proceed to payment. I already have the Creative Cloud software installed on my PC so my browser only had to confirm that I wanted to use this application for the download and installation. 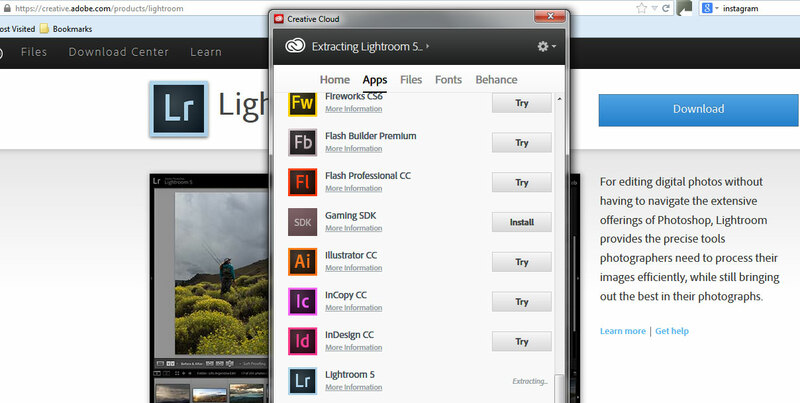 If you don’t have Creative Cloud installed, this may be an additional step for you. I’m on a moderately fast home broadband and it took just over 20 minutes to download. So it’s back the the waiting area, a coffee, and a browse through the Photoshop CC features. Here’s and interesting one: in the Filter | Sharpen menu there is a new filter for Shake Reduction. That’s not in the latest update to Ps CS6! And Camera RAW is available as a filter so if you like using the controls in CR just apply them as a filter to your image – not essential, but neat! And on the File menu there is an option to Share on Behance. To install Lightroom I have to go back to the Creative Cloud application, click the Install button next to Lightroom to start the download/installation of this software. This only takes about 12 minutes. In fact, there isn’t a Creative Cloud version of Lightroom, all I’ve done is download and install the same piece of software I had as a stand-alone application, though this time Creative Cloud is aware of it and, presumably, will keep it up to date My desktop shortcut works but Lightroom wants me to register , despite having done so when I originally installed the software. It also defaults to use my stand-alone serial number, so what would happen if I were installing it for the first time as part of the Creative Cloud subscription, I don’t know. Oh well, it works for me. so I’ll leave it as it is. It seems that Lightroom is bundled as part of the subscription but without any additional features, not even the integration of Adobe ID in the menus. These are both services rather than desktop applications, so investigating them will be part of a follow-on blog post. So far, then, a fairly painless process! I wonder if it will continue that way?! Adobe’s Photography Program is due to go live this week. It’s not there yet though, perhaps because they’ve been busy rolling out updates to Lightroom and Camera Raw. 2.1.3 Portable or Home Computer Use. Subject to the restrictions set forth in Section 2.1.4, the primary user of the Computer on which the Software is installed under Section 2.1 (“Primary User”) may install a second copy of the Software for his or her exclusive use on either a portable Computer or a Computer located at his or her home, provided that the Software on the portable or home Computer is not used at the same time as the Software on the primary Computer. Also, I notice that the Adobe Subscription Terms allow me a 30-day cancellation period, which is reassuring, and gives me a deadline to finish my evaluation of the Program! Adobe has responded to concerns from the photography community over its policy of moving to Cloud-based applications and licencing these in suites or expensive single apps. For most photographers a suite of professional Adobe apps would lie unused; what we need is some combination of Lightroom and Photoshop. Well, Adobe’s response is the Photography Program. 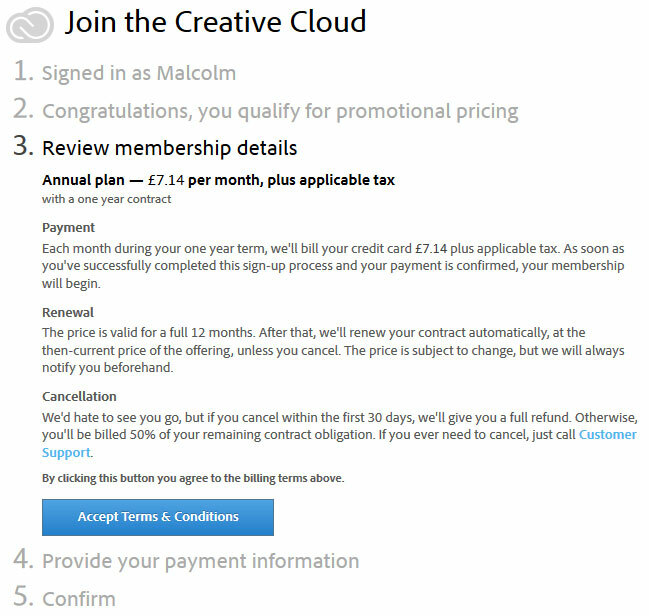 Since I already have a licence for Photoshop I can migrate to this Cloud offering for £7.14 per month plus VAT. That’s £8.57 at 20% tax. What will I get? I’ll have Photoshop and Lightroom installed on my PC and continually upgraded with the latest features and bug-fixes. I can use them stand-alone but I’ll need to connect to the Internet at least once a month to renew the licence (shouldn’t be a problem). 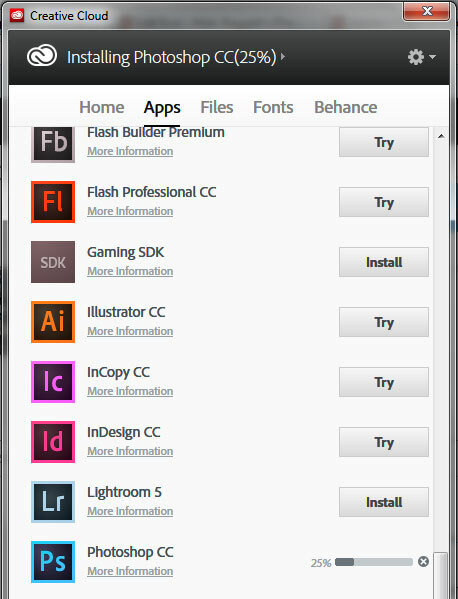 I’ll also get some Cloud storage (could be useful) and a Behance Pro subscription. Behance is a template-based Web site builder and publisher, which has the potential to replace my existing Web site host using my existing URL. What I don’t know is whether the Photography Program licence will cover both my desktop and laptop computers or whether I’ll need 2 licences, but let’s assume 1 licence will cover me, so what are the costs? At the moment I pay £5.80 /month for Web hosting. Upgrading Photoshop and Lightroom costs me about £8 /month (that’s £200 every couple of years), i.e. a total of £13.80 /month. I should be able to replace these costs with a Photography Program subscription of £8.57. Sounds good economically! But what happens if I decide to stop my subscription? In a month my licence will expire and I won’t be able to use the applications. I can always revert back to my stand-alone licences, but in a few years time they will be out of date and unsupported. My files will be on my local computer so I won’t lose them but I will lose the synced versions in the Cloud. I know from my use of other Cloud services such as Google Drive that having Internet access to some files is very useful at times, so I might find myself coming to rely on this service. Alternatives: my use of Photoshop has diminished due to the functionality in Lightroom but I still use it for individual images where masking and layering is needed, so could I find an alternative? There are several candidates but could I cope with the evaluation and learning-curve process? Preferably not! There is an excellent alternative to Lightroom: Capture One Pro, but I have to either keep Lightroom for my past catalogue of work or find a way of migrating every image to C1 – not an inviting prospect without mature migration tools. And I’d rather be doing photography than fussing with the technology. Another unknown is whether I can get enough functionality from Behance to replace my existing site, or will I need to continue to run a stand-alone site? If so I will need another URL at additional cost so why bother with Behance? Maintaining my existing site makes the economics unfavorable and I’d quite like an easier-to-maintain site anyway. I will only know the answer to this one by trying it.